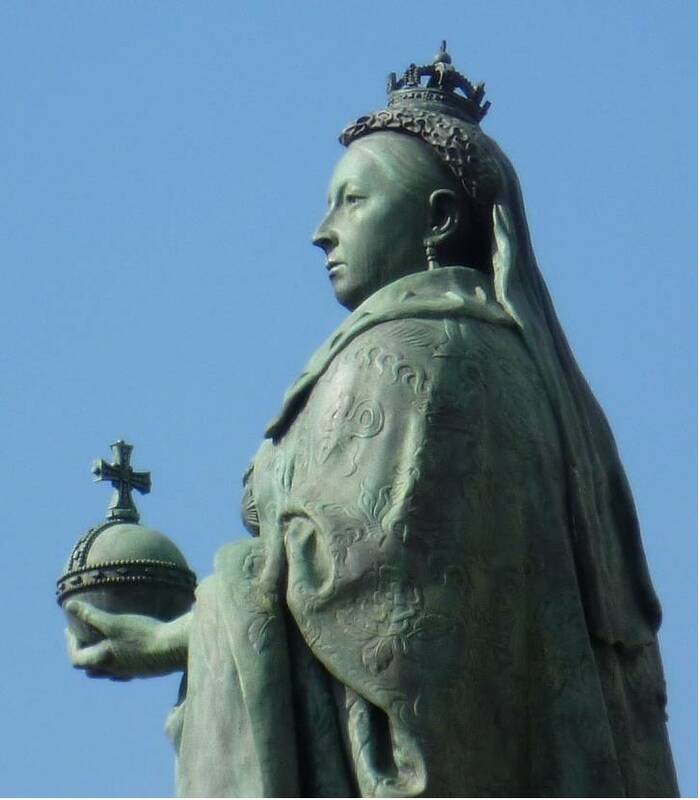 Left: Queen Victoria, by Sir Thomas Brock, K.C.B., R.A. (1847-1922), whole monument, with the Queen's face fully seen. Right: The statue itself, from the front, with the orb more visible. 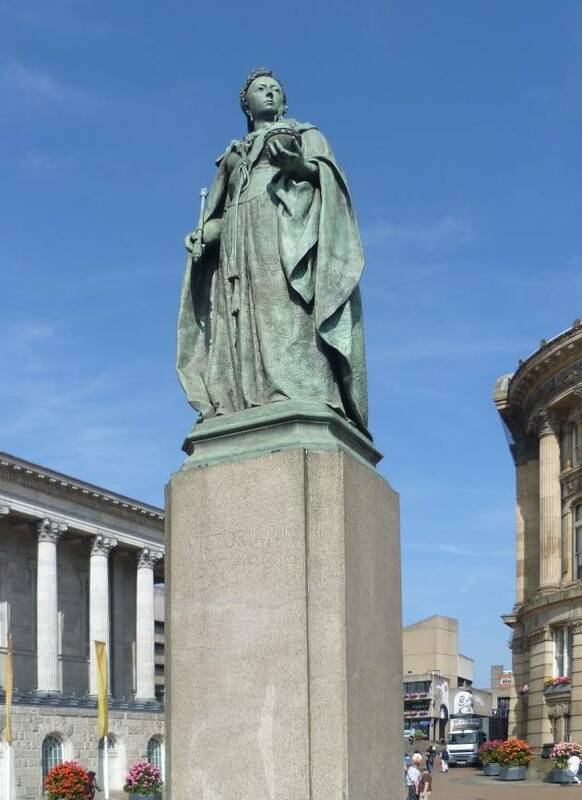 Unveiled in 1901 just before the Queen's death, the statue stands in what then became known as Victoria Square, Birmingham: to the right in the first picture is the projecting corner of Birmingham's civic offices, the Council House; to the left is the older neo-classical Town Hall. The statue was recast from the original white marble in 1951 by the later Birmingham sculptor William Bloye (1890-1975), who designed the pedestal as well (Foster 123-24). 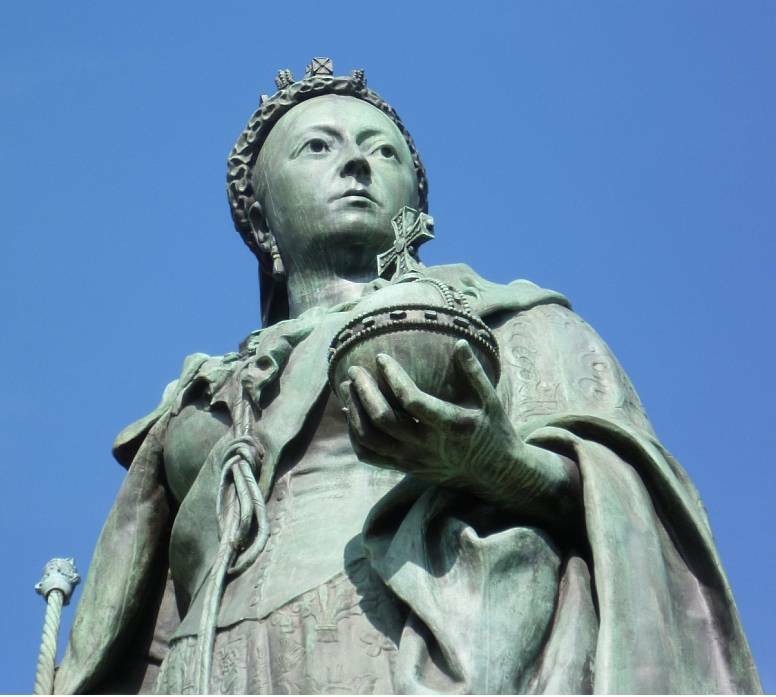 Left: Queen Victoria close up. Right: Queen Victoria in profile. 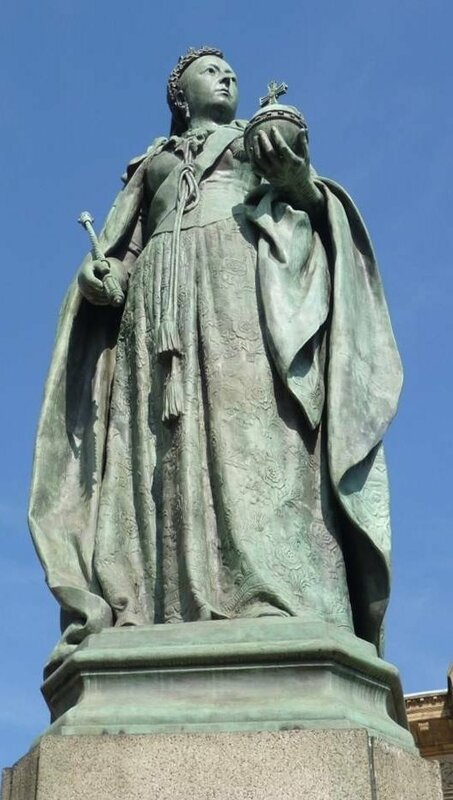 This was a copy of an earlier statue of the Queen that stands in front of the Shire Hall, Worcester (see "Statue of Queen Victoria"), and one can see why Brock's patron, a Birmingham solicitor called William Henry Barber, requested a replica of that particular one. In her ceremonial robes, the Queen looks mature here without looking old, and regal without looking dour or forbidding. The slightly later statue in Belfast looks like another replica. Foster, Andy. Birmingham. Pevsner Architectural Guides. New Haven & London: Yale University Press, 2005. Print. "Our Founders." Barber Institute of Fine Arts. Web. 18 August 2012. "Statue of Queen Victoria [etc.]" British Listed Buildings. Web. 18 August 2012.